Muslims consider dates a sacred fruit. And not in vain. After all, this dried fruit is incredibly useful. Dieticians say that only 4 dates a day will fill your body with all the necessary trace elements. Dates are familiar to many since childhood. They came to us from hot countries and fell in love with many. After all, the date itself is very sweet and can easily replace the candy. Moreover, this fruit is very useful. Interestingly: in ancient times, while traveling through the desert, people who transported goods took dates with them. So that on the road they can eat 3 dates a day. This amount of food + water was enough to not die and feel less normal. Dates can be safely added to cereals, pastries or yoghurts. They easily replace raisins and please you with a pleasant taste. Yes, it is best to choose dried dates with dark skin, without mold or sugar marks. The best are fruits with a stone – they are much sweeter. Dates are rightly considered one of the most useful fruits on Earth, because they not only affect beauty, but they can also solve some health problems. In dates a lot of dietary fiber, so they help to normalize the work of the intestine. 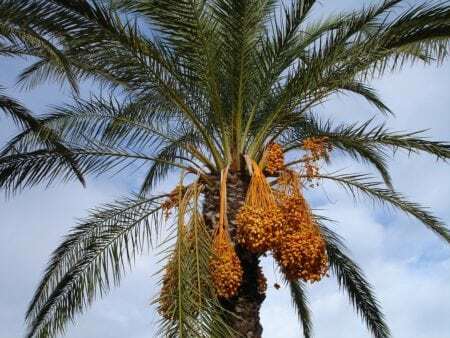 In addition, dates strengthen immunity and control the functioning of the nervous system. That is, if you do not want to be nervous – eat dates. In these dried fruits you will also find potassium and vitamin A. This combination favorably affects the skin, nails and the work of the cardiovascular system. Interestingly: the dates contain: vitamin A, B vitamins, vitamin C, vitamin D, vitamin K.
Dates are useful for pregnant girls. They perfectly saturate, give strength when they are not there and increase hemoglobin. In addition, dates – a reliable defender of the body against constipation, which is also important during pregnancy. It is also interesting that the inclusion of dates in the diet of a pregnant girl, raises the level of oxytocin in her blood and prepares the uterus for future childbirth. Another plus of the dates – they remove excess fluid from the body, which is also incredibly important in the waiting period of the baby. If you lose weight, be sure to include in the diet dates. Despite the fact that this is a high-calorie product, it can help to lose weight. In a day, eat 3-5 dates. Firstly, dates can easily replace sweets, and you can stick to a diet or rules of healthy eating without the sadness of sweets. Secondly, they give energy and you will not feel like a “squeezed lemon”. The main thing, eat them in the morning, when the body needs calories, and for the evening meal, put off something protein (meat, eggs, cottage cheese). Also, nutritionists are advised, during slimming, to drink water, which is infused on dates. It helps to remove excess fluid from the body and stimulates the metabolism in the lymph. In other words, if you drink “date water”, you can get rid of cellulite. Or at least reduce it. To cook such water, cut dates, pour them with warm water and let it brew for 5 hours. Done! In this water, by the way, you can add citrus fruits. Important: dates can not be eaten if you have diabetes. Also remember, any product will bring harm if you use it excessively. So follow the measure.